Gerhard Roth’s slim documentary novel The Story of Darkness (115 pages, including an Afterword by Helga Schreckenberger of the University of Vermont) packs a powerful punch. It begins with Roth explaining the origins of the novel. After having lived in the country for ten years, I moved to Vienna and into the apartment of a former fellow student of mine named Ascher. During the same time period, he committed suicide in my house on the Yugoslavian border. Ascher is immaterial to the novel except to set the tone and to provide Roth with the apartment from which he explores the now-destroyed Jewish neighborhoods of Vienna, looking for a topic for his next novel. I intended to write a novel about Austria, about the open insanity of the Austrian past and the hidden madness of Austria’s everyday life. Walking through a Jewish cemetery, he settles upon the general idea of writing “the life story of an Austrian Jew who left Vienna in 1938 and returned after World War II.” Eventually, he finds such a person in Karl Berger. It was in his little kitchen that I recorded in several notebooks what he had told me about his life. I am reproducing these notes, which I edited, without making any major changes, because I believe that Berger’s reports are so exemplary that they transcend the boundaries of documents and literature. Berger’s story is told in the first person, as if directly from the pages of Roth’s notebook. Here is my hyper-condensed version of Berger’s life. Born in Vienna in 1919, he flees to Slovakia (where he had relatives) immediately after the Anschluss in 1938. Shortly thereafter, Slovakia becomes part of Hitler’s territory, he returns to Vienna, witnesses Kristallnacht and emigrates to England. He tries to follow a woman to Canada by signing on as a seaman, only to be arrested after jumping ship in Canada. Returned to England, he is offered leniency if he will join the Czech exile army. Meanwhile he marries, has a daughter and is sent to fight in France after D-day. In Czechoslovakia at the war’s end, he locates his mother and sister, who survived Theresienstadt, and learns that his father was killed by the SS. Divorce and British citizenship. Stops seeing his daughter (“too painful”). In 1952, he emigrates to Israel, but lasts only a few months on a kibbutz and eventually returns to England, remarries, and moves to Scotland. (“For Israelis, leaving the country is the same as treason…”) In 1959, he returns to “repulsive” Vienna for the first time to visit his mother, but also begins to understand that he’s not really a “true” Englishman. After a brief stay in Germany, he and his family (there are eventually six children) return to Vienna. His twenty-five year old son commits suicide. 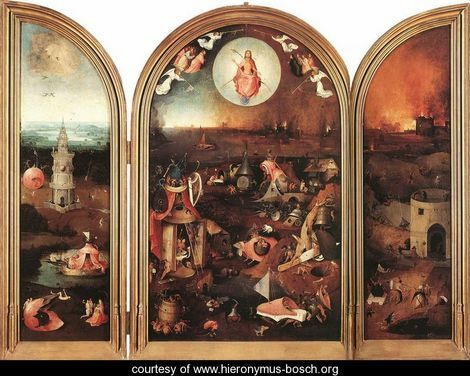 The book ends with Roth and Berger seated in Vienna’s Academy of Fine Arts studying Hieronymus Bosch’s Last Judgment (perhaps a nod to Thomas Bernhard’s novel Old Masters). Appropriately, a museum guard looks on. ‘Earth is hell,’ Berger said in the quietness of the picture gallery, in which only the wooden floor squeaked, when the guard shifted his weight from one leg to the other. Améry defines “Heimat” not as a geographical place, but as a feeling of well-being and security resulting from the knowledge of being a legitimate and accepted member of a community. It made me think when in Spanish they titled “Die Ausgewanderten” as “los emigrados”, instead of “los emigrantes”, which is the common word for “emmigrants” and transmits the idea of eternal movement or disarray. I would like to know Sebald’s opinion on this: can one day emigrants consider their voyage has ended, consider their project fulfilled?